Editorial calendars have been around as long as I can remember. As a copywriter, I love them! They give me insight into the customer, so I can produce pieces that truly work. They show me exactly what I am responsible for producing and put the entire team on the same page, so we don’t waste precious time reorienting ourselves in a topic discussion every time we need marketing material. Just do it! A content marketing plan managed by marketing and sales strategists is critical if you want results. Today’s ravenous digital content demands require a souped-up editorial calendar. We call it the content marketing plan. This plan is heftier than our old editorial plans and more important to the success of marketing. But it doesn’t always get done. And that’s a problem, especially for copywriters and designers who can’t do their jobs correctly without it. 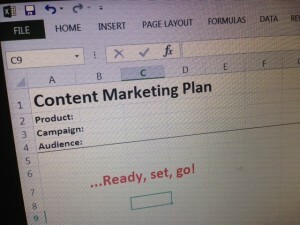 First, how does a content plan get created? In the content plan, the production of content has been irretrievably melded with the marketing plan. We no longer think of topics in isolation or with a general intent to reach our target market. We drill down to more specific intent. The things we write must support not just a target audience, but the incremental stages potential buyers go through during the digital buying process. It’s a very carefully crafted process, especially if we are using automated marketing systems. If it’s not carefully crafted, it won’t work unless we get lucky. And that’s a fact. Once the above questions are answered, the next step is to calculate the timing of certain types of messages using certain mediums, with each piece in the content flow playing a specific role and driving toward a specific action. Each piece in the plan must build on the previous piece and support all of the other pieces. The content marketing plan provides a container into which we plug those pieces. It exists in the form of a spreadsheet or chart. Intending to plan content is not the same as planning it! Here’s the problem: We often talk about creating a content plan, and we even talk about how the pieces will fit together generally, but then the chart doesn’t get done or someone creates it haphazardly. Maybe the content plan doesn’t get done because management puts pressure on us to do something NOW, so we forgo the official plan and launch into the first piece. Once the first piece is done and posted or sent to potential customers, it’s common for everyone to breathe a sigh of relief and other priorities to demand our attention. We tell each other we’ll do it soon. Or we get through the first couple of pieces and think it’s then not worth taking time to create a plan. People on our own teams can sometimes sabotage our plan. I believe this happens when people are feeling stress. One person might say planning is a waste of time and there are too many other things to do. A company leader might not see the importance of the plan and order us to just get something out there to the market and start stimulating sales. I and my freelance marketer partners often can’t get freelance clients to slow down long enough or pay for planning. They just want us to start writing. In today’s marketing environment, it’s more important than ever for writers and designers to understand how marketing pieces are intended to work together in order to create them. And we need to work ahead to get things done by deadline. When no one else is doing a content plan, we often end up creating one ourselves to keep us on track. This might seem like a solution, but it is a problem. Although we usually understand general marketing and sales objectives for the material, we aren’t strategy experts. The evolution of the content landscape has required that we understand more than ever before about how customers are reached and motivated. But we still aren’t strategists. We don’t have time to be strategists. It takes time to write and design. We need marketers and salespeople to work together and carefully understand potential customers, formulate a strategy, and then share it and work with us to create the content plan and produce the pieces. 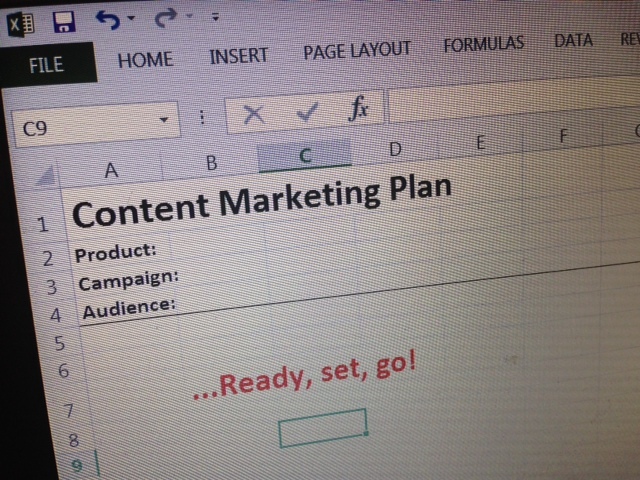 Get on board with content planning! Not creating a content plan is a costly mistake. If we spend money and time on writing content, it is only worth the cost if it does what it’s supposed to do. The only way to get content to do what we want is to weave it together into a deliberate plan led by marketing and sales. If you are a copywriter, hold your ground. Insist on a content plan and don’t let anyone forget about it. You might not be able to refuse to write or design pieces. But you can keep talking about the plan and explaining how much more effective everything will be with the plan in place. Depending on your situation, you might be able to refuse to produce until the plan is done. Consider this permission from me to do it! If you are a marketer, salesperson or business owner, please understand how important the content plan is. Writers and designers desperately want to provide material that does what you want it to (get more business). But we can’t do it if you don’t allow the groundwork to be laid first. If you decide to forego the plan, please don’t blame us when it doesn’t work.